The Quinoa patties or cakes I am sharing today is a convenient filling meal for anyone who has a busy work life and yet wants to cook and eat healthy at home. Week days always demand a simple lunch for everyone who has to sit and work on a desk. We do need a lot of liquids during the day but if the meal is heavier it starts making one sleepy. What works for me in fact is a brunch that is not too complicated to fix and filling enough to keep me full till evening. Working from home most days of the month gives me this liberty to choose my meal time the way I want. Sometimes I switch to a freshly cooked meal like these Quinoa chickpeas or lentil patties for a late breakfast and then have a large bowl of fruit for a late lunch. I am most comfortable when this routine goes on. And then some travel happens for work and all my eating routine gets disturbed though I choose my food carefully even when traveling. I am not complaining, I love what I do. Currently I am designing a wellness menu and all its supporting elements for a luxury hotel in Rajasthan. My work also gives me enough exposure to make complex recipes simplified for home cooking. For practical reasons obviously. These quinoa patties are just that. Simplified and prep work deconstructed in a way that you can make these in 10 minutes flat when you are hungry. Remember that Quinoa makes great patties even if you are a beginner cook.So don't be afraid even if you are cooking Quinoa for the first time. Just cook the grain like you cook rice, I prefer a 1:3 ratio of Quinoa to rice you can adjust to your liking. 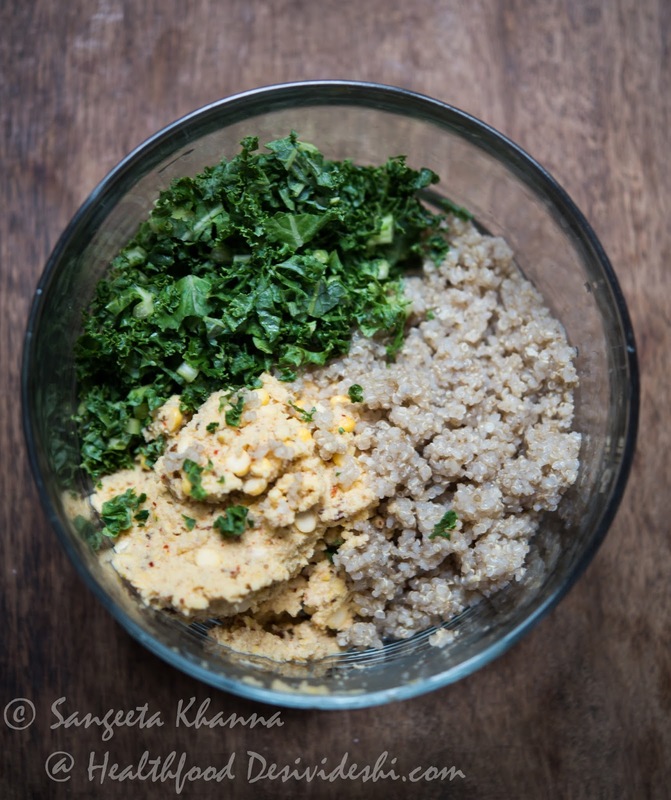 See how to cook quinoa here. 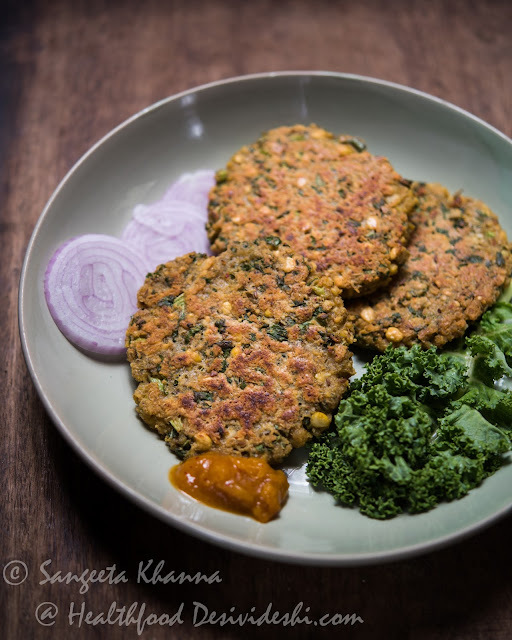 For these Falafel inspired Quinoa patties you just have to keep some cooked Quinoa, some raw Chickpea paste and some raw chopped greens of your choice, refrigerated in separate containers so you can just mix and shallow fry the patties when you feel hungry. Make a coarse paste of everything together in your trusted food processor or mixie. Do not any water while blending the paste. Keep in an airtight container for 3-4 days. 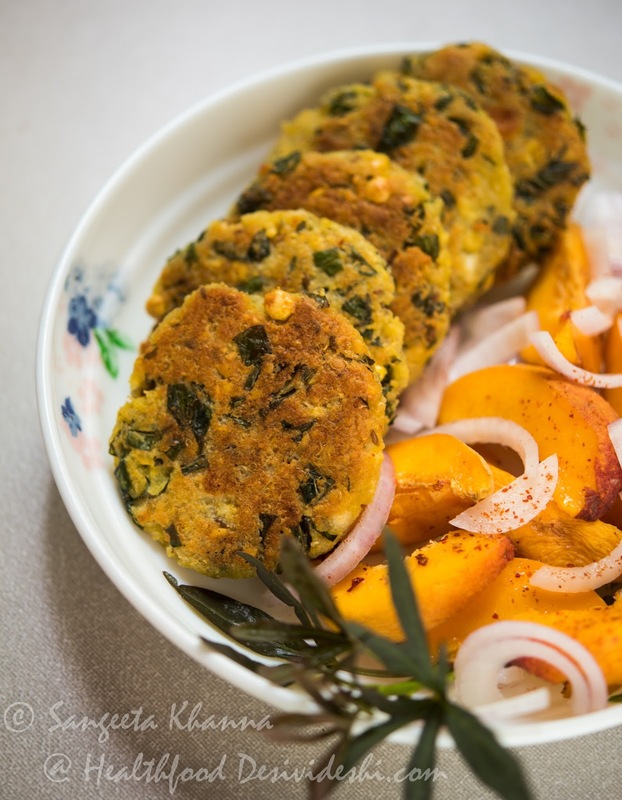 Just mix all the three components, the chickpeas or mixed beans paste, the cooked quinoa and the chopped greens and shape into patties of preferred size. Pat them all on a greased hot griddle and cook both sides till a crisp crust is formed while the interiors remain soft and crumbly. I like serving these patties with some sliced onions, some cut fruit or anything that I find easily doable. A nice slaw will be wonderful if you can manage. The one above is a Chickpeas Quinoa patty with sweet potato leaves, served with onion and peach slices tossed with paprika and lime juice. The platter below is a mixed beans and Kale mix served just with onion slices and a spot of spicy Apricot chutney. It is actually simpler than you think. Try it next week and tell me how easy to follow healthy recipe it was. If you are not into Quinoa you can substitute it with soaked daliya (broken Wheat) or quick Oats and add some Flax seeds meal for a boost in its protein content. You know such patties are so versatile you can flavour them as you like. But I prefer keeping them mild and simple and add on the flavours in the form of toppings or salad with it when I am indulgent. 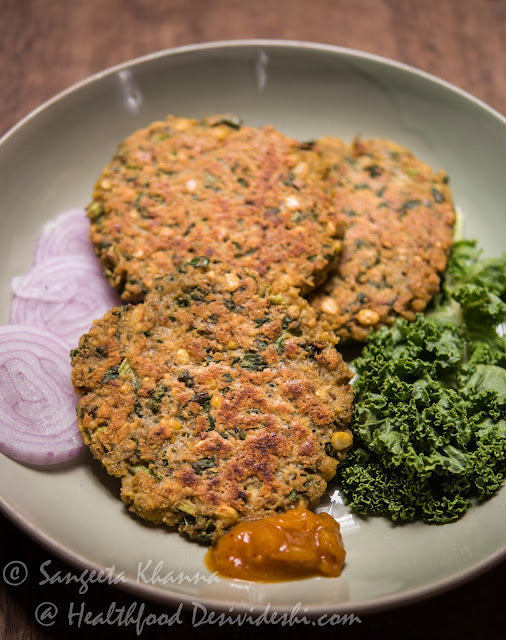 These Quinoa patties can be used to make bun sliders or burger filling too apart from the usual pita or plain bread sandwiches. But if you think these patties are carb free you cannot be more wrong. Both Quinoa and Beans have enough carbs to keep you energized, in fact for longer time because these are low Glycemic carbs.